Michael D’Antuono is known for making art that challenges people to think more deeply about socio-political issues. His collectors range from Arnold Schwarzenegger to Pete Seeger and Malcolm Nance. He has exhibited alongside Shepard Fairey, Banksy, Keith Haring, Ron English, Robbie Conal, and Peter Saul. D’Antuono’s art has been covered by many media outlets both national and international and has appeared on PBS, Fox News, Glenn Beck and Marc Maron’s shows. D’Antuono burst upon the national stage in 2009 with what is arguably the most controversial painting of the millennium, titled, “The Truth.” The provocative piece depicting President Obama standing in front of the presidential seal in a crucifixion-like pose ignited a firestorm. The Religious Right instigated by FOX NEWS, threatened to bus protesters from other states to his planned installation in New York City. He received thousands of angry emails and garnered international headlines. A similar hysteria occurred when he exhibited the piece at a college in 2012, prompting Herman Caine and Bill Donahue to denounce the piece and Glenn Beck to devote a couple of shows to it. 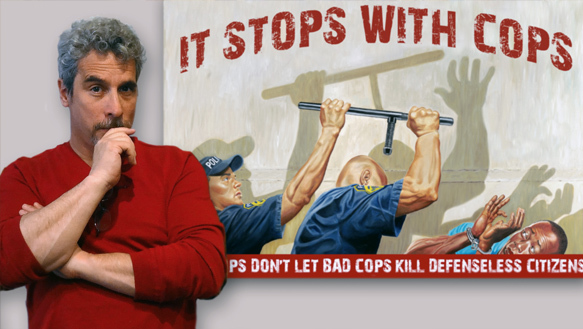 D’Antuono’s art was the center of another controversy in 2013, when George Zimmerman capitalized on his notoriety gotten from killing Trayvon Martin by auctioning his first painting on eBay. In response, D’Antuono decided to auction his painting, “ A Tale Of Two Hoodies” on eBay with 50% of the proceeds going to The Trayvon Martin Foundation. The piece depicts a KKK hooded police officer pointing his gun at a black child who is offering him candy. On the very same day that eBay allowed George Zimmerman to complete his auction, earning him $100,000, eBay pulled D’Antuono’s auction despite the fact that D’Antuono’s was well on track to surpass Zimmerman’s price. eBay cited their strict policy of “not promoting hate groups or selling any KKK related items on their site as the reason even though they had over 1,600 other items listed on their site related to the KKK when they removed D’Antuono’s. “A Tale Of Two Hoodies” continues to be the object of censorship and controversy. In January, 2016, a high school teacher in Dayton, Arizona was suspended for using the painting as part of her final exam after parents at Dayton High School expressed outrage. In February of 2016, local police in Oldham County, Kentucky demanded another high school student’s homage to the piece be removed from exhibition. In March, a 10th grade student in Denver Colorado agreed to remove her homage to D’Antuono’s piece from a public exhibition after outraged local police unions voiced objections to the piece. Determined to move beyond the limitations of a paint brush in awakening white America from the comfort of their ignorance concerning the depths of modern racism, the artist has recently completed a short film on Institutional racism titled BLACK INJUSTICE AMERICA. He is currently scheduling appearances and screenings of the film.